I was born during the run of Happy Days and its spinoff Laverne and Shirley. I remember, as a young child, watching the reruns of these popular shows and while Happy Days was a fun show, I adored the depiction of the two working – class women in Laverne and Shirley—even in their animated tv show! I loved my coloring book featuring the two. I jumped at the chance to read Shirley I Jest: A Storied Life when I saw it on Netgalley. Cindy Williams relates her early life honestly, featuring a few things that would have brought down weaker people. I was very impressed by her story, and while I was unaware of her early (possible) struggles, it only makes me respect her more. Her long and diverse career in hollywood is still going strong, thanks to a recent appearance on a disney tv show. Despite so many stories about ill will between her and her costar, Penny Marshall, Williams does not mention the issues, ever the classy lady. This book reads much like a conversation with Williams, possibly over coffee—a very long and storied conversation. And the forward by her friend, Ed Begley, Jr was thoughtful and really lovely. 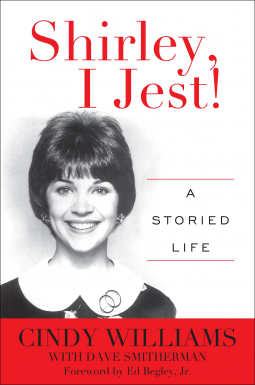 It is clear, by reading Shirley I Jest: A Storied Life, Cindy Williams has had a great life, made possible by her acting. Cindy does describe a picture taken for Paramount’s 75th Anniversary where she is standing between Ted Danson and Matthew Broderick—however, when I found the described photo, Cindy appears to be in the upper right hand corner of the picture. 75th Paramount Anniversary picture on askmanny’s Flickr page (okay to share, per creative commons). Overall, I enjoyed reading Shirley I Jest: A Storied Life. I enjoyed the stories at the end about specific celebrity meetings, as well as the portions of the book talking about her friendship (and foray into comedy) with Andy Kaufman. I think a great compliment to this book would be Penny Marshall’s My Mother was Nuts. This was my first read of 2015, and while it is not yet out, the publisher, Rowman and Littlefield, allowed me to read it early in exchange for my honest review. It is available, from your favorite retailer on May 5, 2015. First of all….your blog is fantastic. So glad I found it. Looking for a follow button. ENJOY your first read of 2015!! Sounds like a fun memoir. I recently read Anson Williams’ memoir. I liked it.